P2156 Yoda Connect & Build Pen is a Star Wars Pen released in 2007. It contains Yoda, a pen, and several parts for it. 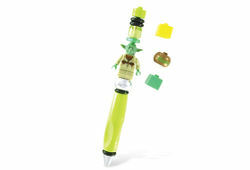 It is the same as 3804 Yoda Pen, which was an Amazon.com exclusive. Facts about "P2156 Yoda Connect & Build Pen"